Schwarz, founder of the groundbreaking Citizen Schools program, shares his vision for reducing inequality by pairing successful adults with low-income students. Parental wealth now predicts adult success more than at any point in the last hundred years. And yet as debates about education rage on, and wealth-based achievement gaps grow, too many people fix the blame on one of two convenient scapegoats: poverty or our public schools. But in fact, low-income kids are learning more now than ever before. The real culprit for rising inequality, Eric Schwarz argues in The Opportunity Equation, is that wealthier kids are learning much, much more—mostly outside of school. In summer camps, robotics competitions, sessions with private tutors, and conversations around the dinner table, children from more affluent families build the skills and social networks that propel them to success. 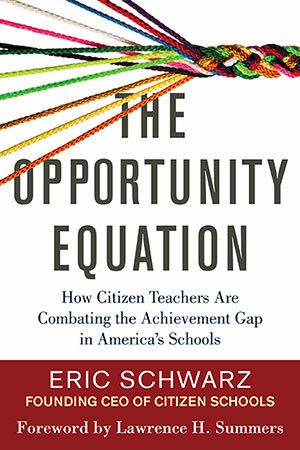 In The Opportunity Equation, Schwarz tells the story of how he founded the pioneering Citizen Schools program to combat rising inequality by bringing these same opportunities to children who don’t have access to them. By increasing learning time in schools and harnessing the power of an army of volunteers with various skills and professional backgrounds—lawyers, engineers, carpenters, journalists, nonprofit leaders, and grandmothers who sew—Citizen Schools offers after-school apprenticeships that provide the building blocks for adult success. Recounting the triumphs and setbacks he’s encountered in implementing the program, Schwarz shows that some of the nation’s lowest-performing schools in its lowest-income cities can, with help, provide their students with many of the same experiences wealthy communities afford to their children. The results have been proven: in the dozen school districts, from New York to Oakland, that have partnered with Citizen Schools, rates of attendance, proficiency, graduation, and college acceptance have gone up—and the achievement gap closes. At a time when many stakeholders in the education debates are looking for new, silver-bullet shortcuts to educational excellence, Schwarz shows that the best solution is human-centered, rooted in the American tradition of citizen voluntarism, and, most important, achievable. We can provide quality education for all students and close the opportunity gap in this country—and we can do it together. As Adam Barriga entered the Massachusetts State House, with its towering golden dome and rooms full of history, his sneakers squeaked lightly on the Italian-marble floors. Adam, age twelve, had been grumpy most of the day. But now, as he made his way to the capitol building’s main lobby, walking past flags and portraits and a mural of the Revolutionary War Battle of Concord, he forgot entirely what had been bothering him. Once in the lobby, Adam joined hundreds of his classmates involved in all sorts of hands-on learning projects. The students were sixth and seventh graders attending public schools in Boston, and almost all of them qualified for a free or reduced-price lunch, meaning their family incomes were below or a little above the poverty line. About half of them had school-identified learning disabilities or spoke a language other than English at home or both. But soon all of them would be talking to an appreciative adult audience about robots they’d programmed, video games they’d designed, Android apps they’d invented, or, as in Adam’s case, rocket ships they’d built. The event was what we at Citizen Schools call a WOW!—a chance for students to showcase their learning and, hopefully, “wow” those in attendance. This particular evening the crowd included elected officials and executives from leading technology companies such as Google and Microsoft and Biogen Idec, one of the fastest-growing biotechnology firms in Massachusetts. I noticed how the politicians and executives moved through the State House effortlessly, smiling for pictures with families, asking questions of the students, and genuinely enjoying an event listed as a “stop-by” on their schedules. Cultivating support from guests at a WOW! was important, and I was pleased with the level of engagement. But what really stuck with me from that May evening in 2010 were the experiences of three others in the room. First was Adam himself, then a sixth grader at the Clarence Edwards Middle School in Boston’s Charlestown neighborhood. The Edwards, or Eddy, as it’s known locally, had recently partnered with Citizen Schools to expand the learning day for all students from six to nine hours as part of a statewide Expanded Learning Time pilot program for struggling urban schools. Adam was demonstrating what he’d learned from one of his Citizen Schools apprenticeships, It Is Rocket Science!, and tentatively conversing with parents and politicians and anyone else who would listen. His confidence grew over the course of the evening as he talked about escape velocity, lunar windstorms, and solar flares, and as he described the final project he and his classmates had participated in: a simulated lunar landing performed by videoconference with real astronauts from NASA. Second was David Mantus, the teacher of the It Is Rocket Science! apprenticeship and a repeat volunteer at Citizen Schools. David had grown up in the suburbs of Long Island, and he shared with me that his fondest childhood memories were of launching rockets in his backyard with his dad, a NASA engineer, and visiting science museums on the weekend with his grandfather. Later, Mantus earned a PhD in chemistry and eventually climbed the corporate ladder to become head of regulatory affairs for Cubist Pharmaceuticals. As Mantus moved further away from hands-on science in his own career (from mixing chemicals in the lab, to schmoozing regulators on the conference circuit), he had lost a little of himself. This increased his desire to inspire future scientists. At the State House, Mantus prompted his middle school apprentices to explain what they had learned, but then he invariably built upon their answers, adding scientific detail as he revealed more than a trace of boyhood excitement. Adam and David each burst with pride, and in their unlikely relationship and shared enthusiasm for launching rockets, I saw great hope. But my greatest joy that night came from the smile of wonderment worn by Adam’s grandfather, Eduardo Barriga. Barriga had emigrated from Peru thirty years previously. For almost his entire life in the United States, he had worked as a custodian at the State House. The marble floors where Adam held forth, and where CEOs and politicians gathered, were polished with his own hands. Now his grandson was standing on them with something important to say.